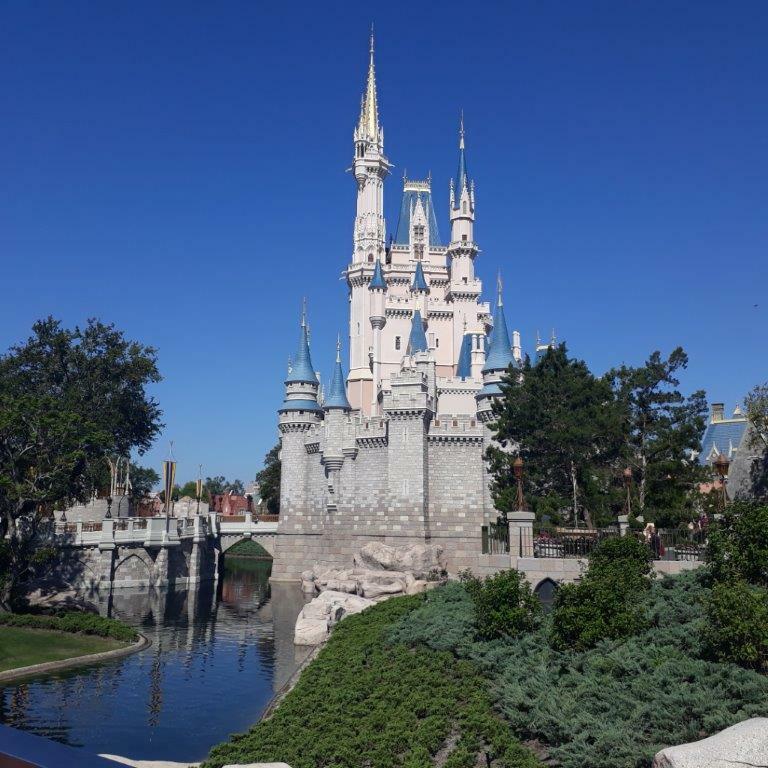 This week is about how we saved money staying on-site at Walt Disney World (WDW). We stayed at the All Stars Music resort, which is the budget hotel – but all our money saving ideas apply equally to the other WDW hotels. I cover Accommodation, Transport, Food, Drinks and Souvenirs. Whatever price you wish to pay for a hotel in Orlando – there is a hotel in your price range. We chose to stay at the Disney All Star Music Hotel on site. There are so many advantages of staying on site I don’t really know why anyone would stay elsewhere. The hotel accommodation at around $120-130 AUD per night was great. It was clean, the service was exceptional and the pools were heated and really nice. The whole atmosphere of the All Star Hotels was like a village with a lot of families. Transport to and from the Airport is free at WDW resort hotels via the ‘Magical Express’ bus. This saves you approximately $70 USD each way in a taxi. You get a free magic band when you check into your hotel which is linked to your theme park tickets and Fastpasses. The Magic bands have multiple uses like opening your hotel room door, buying food and souvenirs with. The Magic bands are also connected to PhotoPass and automatically take video of you on rides in the parks and photos from cast members. They are also engraved on the back with your name which is a really nice touch. Disney All Star Music Hotel - the pools are heated! As we stayed on site at WDW All Stars Music hotel, we were able to use the free Disney buses that took us to and from all the theme parks. They were extremely regular – every 20 minutes with organised rope lines and signage. The buses were clean and if you had a disability there were access ramps on all the buses and helpful staff. Some bus drivers provided commentary which was quite funny -which added to the trip. A trip to the parks would take less than half and hour and often much shorter. The All Stars Music was also a pickup hotel base for ‘Take Tours/Grayline’ all day bus trips to Miami and Kennedy Space Centre (both trips I highly recommend). This was an added plus in staying at this hotel over the other two All Star Hotels. Also, there weren’t many other Disney hotels that the Take Tours company picked up from – but you could pay extra to divert the bus to pick you up at another hotel. As our pick up time for Miami was 6:45am, we were happy to be picked up at our hotel (and dropped off later that night). For transport to The Vineland Premium Outlet shopping mall and Universal Studios we used Lyft to get there and back. The cost to Universal Studios one way from the resort was $17 USD– which I thought was a bargain as we were driven straight to the entrance and didn’t have any costs like car hire, parking fees, petrol etc. With Lyft and Uber, you do need Wifi. I set up both apps on my phone in Australia before we left. At the shopping Outlets, we used the Starbucks Wifi to book a lift back to our hotel. Lyft and Uber quote the price when you book so you know how much you are paying. The app also lets you know whom your driver is, car model and driver rating. We waited no more than 10 minutes for all Lyft transport. Food – use the app to decide whether Disney Dining plans are worth it. Disney Dining Plans – We didn’t think this was great value unless your family really are big eaters. On average, our family of three (2 Adults, 1 child, 10 years old) were spending roughly $30 USD per meal, whether it was breakfast, lunch or tea. We would share the bits of the meal someone didn’t eat so it worked out well for us. Eating was just really a refuelling and rest stop for us as our main priority were the rides. Disney Dining plans (the cheapest) start at $52 per Adult and $22 per Child per day). I can see the advantage prepaying for all your meals– but if you don’t spend the entire amount allocated per day – then you lose that money. We saved approximately $50 per day by NOT having the Disney dining plan. The money is better off in your pocket. With the Florida heat you will also naturally eat ‘less’. One fantastic thing about the My Disney Experience App is that it actually has the menu options for each food restaurant, so you can see before you go on holiday what sorts of foods and prices they have. And you can therefore work out beforehand whether the Disney Dining plan will save you money or not. Not all food places are covered by the Disney Dining Plan either. Magic Kingdom – Cosmic Ray's Starlight Café -This restaurant had a window seat view of the castle, and a free salad topping bar. Could not fault it- includes a show and the prices were reasonable. The Chicken burger was actually very good and we came back here twice. A lot of the counter service restaurants in Magic Kingdom only sold hotdogs and hamburgers. Cosmic Ray's Starlight Cafe has a window seat view of the Castle! Disney Hollywood Studios – We can recommend ‘ABC Commissary’ as a ‘walk up’ restaurant to eat reasonably priced food which also includes a salad topping bar. I ate a Chicken Club sandwich for just over $10 USD here and it tasted good. The recommendation I was given for this park was Sci-Fi Dine-In Theatre Restaurant, but you couldn’t ‘look inside’ the restaurant, and you need to prebook to get a seat. The Trolley Car Café was also ‘recommended’ as a great, cheap, healthy place to eat (it’s a Starbucks establishment) – you have to ask for the food menu. But their choice of food options was very bleak. EPCOT – We ate at the Land Pavilion ‘Sunshine Seasons’ and the France Pavilion. The Sunshine Seasons had huge turkey and salad sandwiches that were less than $10 USD. There were quite a range of healthy options, maybe because it was in the ‘Land Pavilion’ which was promoting healthy food. The France Pavilion was great value at under $10 USD for ham and cheese croissants etc and was a great bargain place to eat. The lines were long but moved quickly and there was exceptional customer service. As an aside, there are long queues for the bathrooms in the French Pavilion so avoid using these ones at all costs. ‘Club Cool’ in EPCOT offers free Coca-Cola soft drink samples from around the world. Beware the Beverley flavoured one – its extremely bitter! A fun place to try the different flavours, but also a great refreshment stop in the Florida heat. Animal Kingdom – We only ate at Terra Treats where we got Hummus with Vegetables which included Pita bread, fries, carrot and celery sticks, hummus, falafels (a lot spicier then I thought they should be) for $19 USD in total. At the resorts, we found that the Disney All Stars Movie resort had the ‘Make your own salad’ bar, which is great for fussy eaters and also a healthier alternative. You can also add meat to your salad. The ‘Make your own salad bar’ can be found at other resorts (check app) as well as a ‘Make your own pasta’ bar too. Just check the restaurants surrounding your hotel on the app which restaurants do have these. Meals are around $12 USD. The Resort Gift Shops sell cheaper food then the Resort Restaurants! In the Disney resorts, ‘healthier’ certainly cost more. At the resorts a cup of sliced fresh fruit was $6 USD and one banana $2 USD. As there are free toasters to use at the resort restaurant, we bought a $3 USD loaf of bread at the gift shop in Disney’s All Stars Movies Gift shop and used that instead of the $1 USD per slice bread in the restaurant. The Gift Shops at the Disney All Stars parks also sold 2 L milk for $4 USD. Inside the restaurant, they were selling 250 mL milk for $5. So to put on my breakfast cereal, we used the 2L milk we carried in a portable container to the restaurant. Buying milk and bread from the All Stars gift shop was far more economical then buying from the restaurant and we saved a lot of money this way. We kept these items in the hotel fridge. There were also fruit carts scattered around the Disney Resorts. I can’t report that they were ‘great value’ for cost, but they were a healthy option. We generally took our own snacks to the parks. Disney Springs – we signed up for Earl of Sandwich online and you regularly get discounts for sandwiches. One of the discounts was $5 USD off our next purchase. Lastly, I will briefly mention Universal Studios – the best value restaurant in all the theme parks we ate at was San Francisco Pastry Company, which was near the entrance to Diagon Alley. They sold Ham & Swiss Croissant Combo or Turkey combos which included fruit (strawberries and cantelope) and potato salad for less then $10 USD. Slices of delicious looking cakes were less then $4 USD. Bargain. Strangely, there were no kettles in the All Star Hotels. Hot and Cold water however is free at Disney Resorts and parks. So we recommend bringing from home your own reuseable ‘keep cup’ for hot water and refillable water bottles for the cold water. I am happy to say that Orlando water is perfectly fine to drink despite reports to the contrary on how bad it tastes. We brought our own tea bags and coffee from home, so we just needed the water. And of course, we had the milk as mentioned previously. 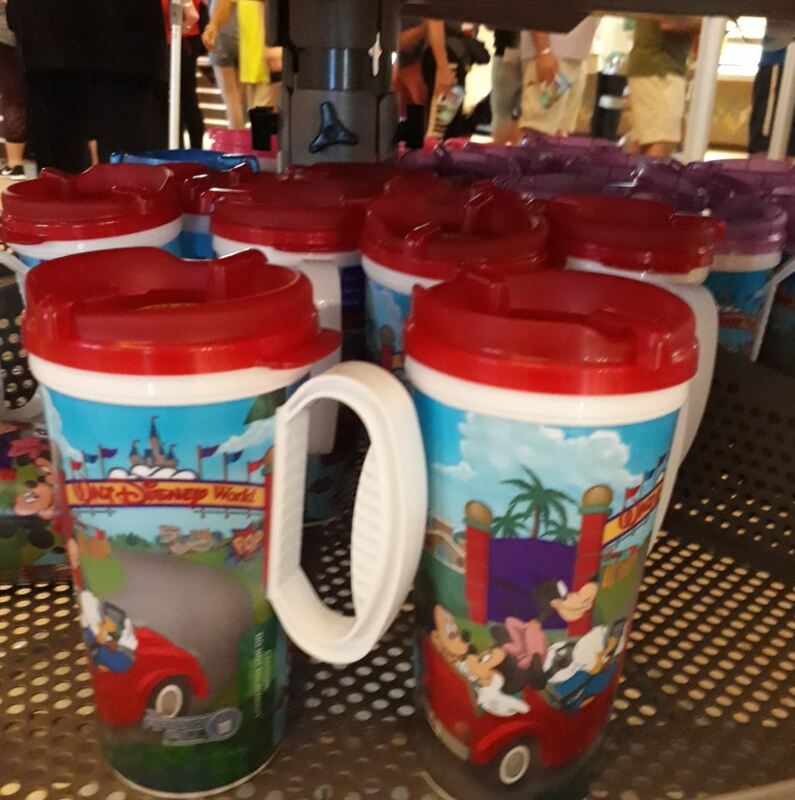 The Disney Resorts sell $20 USD refillable cups that last for 14 days with ‘unlimited’ refills. I believe you are allowed 3 drinks per hour (it is all electronically computed). 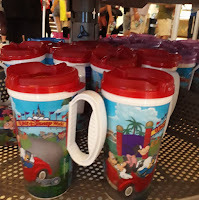 We didn’t think it was great value though as the cups are huge (hassle to carry around), and also really only worth it if you are spending a lot of time at the Resort, to refill. We really only ever ate breakfast at the resort. The $20 USD refillable cups. Memory Maker Photo pass? Worth it? Disney has a Memory Maker Photo Pass service open to its guests, whereby you can pre-purchase all your photos ($169 USD prepaid 3 or more days prior to commencement of your holiday) or after your trip ($199). If you are spending multiple days at the parks, this can be a great way to get all the photos of your family in all the photos. You just need to approach a Cast Member (with a camera) in the park, and they will take your family photos. They link the photos to your Magic Band/or entrance pass. Once your magic band is linked, Disney also includes automatic videos of some of the rides you go on and more. Once you return home from your vacation you can download all the videos and photos. Some of the photos have extra 'editing', like Tinkerbell added for instance. Please note you only have a certain amount of days after your trip to download the photos however, so check the official Disney Website for conditions. What you may not know about however, and this is what we did for our Orlando trip- is you can also just do a one day Photopass for $69 USD. We thought it was worth it as we just consolidated all our must do photos into one park day. This option is on the My Disney Experience App only - and only appears on the app after you have taken at least one photo with a Castmember. We had our group photos taken at the Castle and we had some great videos of us on the Seven Dwarfs mine train. Whilst getting the photo pass for multiple days in multiple parks is great - be aware that there are often lines associated with getting photos taken (with characters etc) and this will eat into your Disney time. Lastly, any Castmember will take your photo for free with your own camera. So, often the Castmember would take our photo with Photopass, but then we would get the same identical family photo with our own camera. The only thing you do miss out on is getting the 'on ride' photos and video (although please note not all rides have this feature). The ‘Disney’s Character Warehouse’ store is here and we found an unbelievable amount of bargains to be had in this store. Large Disney plush toys were less than $10 USD, Light sabers with sound were $10 USD, Disney Pins less than $4 USD. The staff were constantly restocking the shelves so we visited at the end of our visit on the same day and found even more items on sale. There was a lot of merchandise from Shanghai Disneyland (Shanghai’s opening day) and from Disney Cruise lines. My advice would be to come here first before purchasing merchandise in the parks! The sporting stores here were also excellent value. My husband saved significant money buying sporting clothes and goods from here. Genuine discounts on expensive brands throughout the Outlets.